This just in… the book is out! 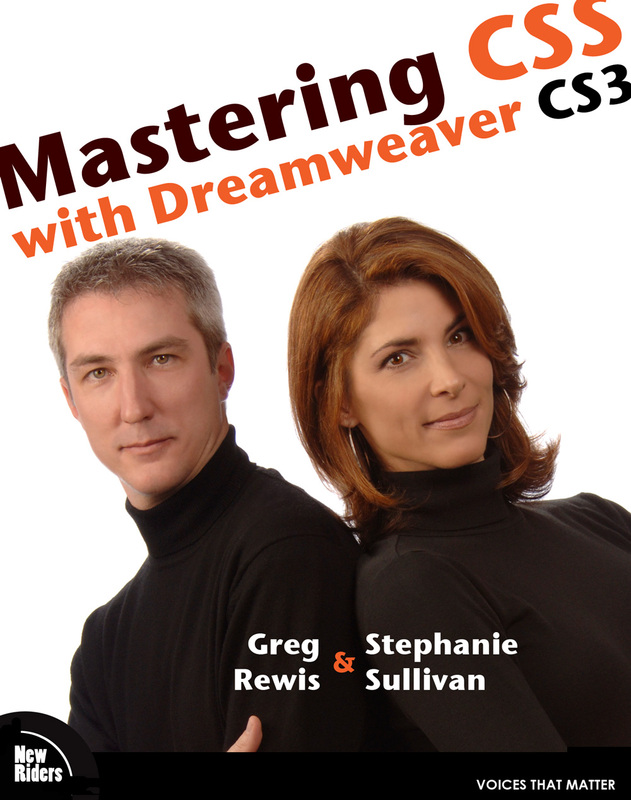 I co-wrote the book with Stephanie Sullivan, the mastermind behind the new CSS starter layouts in Dreamweaver CS3, and although we originally “planned” on the book’s release to follow on the heals of the release of Dreamweaver CS3, we quickly found out just how difficult writing a book could be when you simultaneously have to do a “real job”. “It’ll be easy,” I said, “I’ve got tons of time to write while on airplanes, in hotel rooms, etc”. But, I really should have known better… Most of the time that I’m on a flight, I’m headed off to do a conference presentation or a seminar roadshow. And, of course, in keeping with the motto of “keep it fresh”, I’m always tweaking files and experimenting with new ideas on the plane. Once on the ground, there’s food to be found, sports to be watched, and when in Europe, good beer to be consumed (oops, maybe I shouldn’t have mentioned those last two). And while Stephanie gamely tried to keep me on task, her own travel, speaking engagements and the need to run a business quickly made us a procrastinating “pot and kettle”. But, we finally did it. And, quite honestly, it was worth it – the wait, that is. One of the main reasons is that we were able to really work through the examples in a thorough manner, getting in all of the info that both of us are constantly asked about during conferences. The other great news about the delay is that I was able to completely change the last chapter of the book to incorporate the latest release (1.6) of the Spry Framework for Ajax. Anyway, we hope you enjoy the book – we’ll both be looking forward to hearing your comments (only the good ones, of course! ), and if you track us down at any of the numerous conferences and trade shows that we’ll be at this year, we’d love to hear your suggestions for our next book… Wait, did I just agree to do this whole thing again?! Shoot me now! With the official release of AIR last week, the Spry team released an updated version of the Spry Framework for Ajax on Adobe Labs. This update adds, in addition to a few bug fixes, compatibility for AIR 1.0. This is where things really start to get interesting – the ability to deliver an enhanced experience within a web browser, but then also leverage the same code to build a desktop-based, cross-OS application. For an example of this, the team updated the current Spry photo gallery sample to show how this can be done. And even better, you don’t have to wade through the code trying figure it all out – they put together a case study on what changes needed to be made in order to have the app run on AIR 1.0. The code is completely laid out, and the article explains the changes and implications to the app. This is definitely worth a read. You can view the AIR-compatible gallery example here. I’ll be experimenting with a project of my own over the next week or so and look forward to reporting back on my experiences. Cheers!